HMS Thunderer was a Common Type, 74-gun, third rate ship of the line of the Hero Class, built at the Woolwich Royal Dockyard. She was one of a pair of ships designed by Thomas Slade, Co-Surveyor of the Navy, built to a slightly altered version of the 74-gun ship HMS Hero. The other ship was HMS Hercules, built at the Deptford Royal Dockyard. They were four inches wider at the beam than HMS Hero, but in all other respects, were identical. The Slade-designed HMS Hero was originally a one-off, based on Slade's earlier Dublin Class, the first serious attempt by the British to design a 74-gun ship following the end of the era of the Establishments. The Common Type of 74-gun ship was by far the most numerous of the Royal Navy's ships of the line. They were the smallest ships able to carry a full battery of 32pdr long guns on their lower gundecks and represented the best compromise between speed and agility on one hand and strength and firepower on the other. In the right hands, they could and did go into action against much larger and more powerful enemy ships and emerge victorious. They began to be superceded by the larger and more powerfully-armed Middling Type in the early 19th century, but as a whole, the 74-gun ship was the backbone of the Royal Navy's battlefleets for almost a century. HMS Thunderer was ordered from the Woolwich Royal Dockyard on the 15th July 1756 and her first keel section was laid on the 17th September. Construction was supervised by Mr Israel Pownoll, Master Shipwright in the Woolwich Royal Dockyard and the ship was launched with all due ceremony into the River Thames on the 18th May 1760. At the time the ship was built, the Seven Years war was underway and ships of the line were desperately needed. Such was the hurry that HMS Thunderer commissioned into the Channel Fleet under Captain Charles Proby a full two months before she was launched. She was declared complete at Woolwich at a cost of £39,155.16s.9d. On completion, HMS Thunderer was a ship of 1,609 tons, she was 166ft 6in long along the upper gundeck and 136ft long along the keel. She was 47ft 2in wide across the beams. The ship was armed with 28 x 32pdr long guns on her lower gundeck, 28 x 18pdr long guns on her upper gundeck, 4 x 9pdr guns on her forecastle with fourteen more on her quarterdeck. In addition to her main guns, she was fitted with about a dozen half-pounder swivel guns along her upper deck handrails and in her fighting tops. Captain Charles Proby was an experienced commander who's previous appointments had included the 90-gun ship HMS Namur and in July 1760, he received orders to take the ship to the Mediterranean, leaving on the 21st. In October 1772, HMS Thunderer entered the Royal Dockyard at Woolwich and began a Large Repair. All of the Royal Dockyards except Chatham had seen large scale layoffs after the end of the Seven Years War and for that reason, the repairs to HMS Thunderer took until November 1777 to complete at a cost of £28,160.16s.5d. In the meantime, the trouble in the American colonies had escalated into a full-scale, armed rebellion. The British had seen their troops driven off in the skirmishes at Lexington and Concorde, had been driven out of their former stronghold at Boston and had suffered defeats at the hands of the part-time soldiers of the colonial militias in two battles at Saratoga and an attempt to capture the port of Charleston had been repulsed with heavy casualties. The Americans had issued their Declaration of Independence and the French had begun to quietly supply them with arms and money. The British, realising that they were losing the war, were preparing to make major concessions to the Americans; a move which the French countered by offering unlimited military support and financial aid in return for the Americans seeking nothing less than complete independence from the British. The French King hoped that with the British bogged down in a war of attrition in North America, he could regain the possessions and prestige lost in the Seven Years War. On February 6th 1778, France signed the Treaty of Amity and COmmerce with the Americans, formally recognising the United States of America as an independent nation for the first time. A month later, with the Americans no longer interested in diplomacy, Britain declared war on France. Meanwhile, later in February 1778, with the crisis reaching boiling point, HMS Thunderer recommissioned for the Channel Fleet at Woolwich under Captain the Honourable Robert Boyle Walsingham. At the time of the beginning of the American War of Independence back in 1775, the Tory Party formed the Government and Lord Sandwich, an avowed Tory, was First Lord of the Admiralty. There were also a great number of supporters of both parties serving in senior positions in the Royal Navy and all used their political allegiances to undermine their political rivals where they could. In addition to this, the opposition Whig Party was bitterly opposed to the war in America in the first place. They generally agreed with the American protests of 'No taxation without representation' and in support of that political position, Sir Augustus Keppel, now a full Admiral and an MP for the Whig party, had refused to take any appointment which would pit him against the American rebels. With tensions against the old enemy across the English Channel building, Keppel had been pursuaded by King George III himself to take up the appointment as Commander-in-Chief of the Channel Fleet, Lord Sandwich saw to it that Vice-Admiral Sir Hugh Palliser, also an MP and an equally fervent Tory as well as being a former member of the Board of Admiralty, was appointed as one of his divisional commanders, in charge of the Channel Fleet's Rear Division. Little wonder then, that Keppel felt isolated and vulnerable and that his appointment as Commander-in-Chief had the makings of a political stitch-up. Indeed, Keppel had only agreed to take the job as Commander-in-Chief Channel Fleet on receiving assurances from the King himself that he would be protected from the vicious political infighting over the war. The King saw Keppel as the most gifted, experienced, distinguished and senior Admiral the Royal Navy had. This and the fact that war against the old enemy across the Channel was brewing, whatever their positions, the political opponents now running the Royal Navy and the Channel Fleet were prepared to put their rivalries to one side, for now at least. On the 24th June 1778, Keppel joined the Channel Fleet at Portsmouth and hoisted his command flag in the 98-gun, Second Rate ship of the line HMS Prince George. Prior to his arrival at Portsmouth, Keppel had been assured by Lord Sandwich that 20 ships of the line would be ready. To his horror, on arriving, he found there were only six. The situation was compounded by the fact that Keppel had been ordered to detach eleven ships of the line from the Channel Fleet under Rear-Admiral Sir Hyde Parker in order that they could join a fleet to be commanded by Vice-Admiral the Honourable John Byron, which he in turn was to take to the Caribbean to reinforce the British naval presence there. Such was the shortage of men that Keppel was forced to order that jails in the Portsmouth area be raided to find men to man the fleet. On 9th May, Parker's force left Portsmouth and shortly after that, more time was wasted by a Royal Review of the fleet. All the while all this precious time was being wasted, Keppel was acutely aware that the enemy was building up the strength of the Brest Fleet. At the end of May 1778, the 100 gun First Rate Ship of the Line HMS Victory completed fitting for sea after having been in the Chatham Ordinary since being floated out thirteen years before and Admiral Keppel transferred his command flag to her. HMS Thunderer was assigned to the Centre Division of the Channel Fleet, commanded by Rear-Admiral John Campbell, also based aboard HMS Victory. HMS Victory (Fleet Flagship and flagship of the Centre Division, 100 guns), HMS Prince George, HMS Queen (Flagship of the Vanguard Division), HMS Formidable (Flagship of the Rear Division), all of 98 guns, HMS Ocean, HMS Sandwich, HMS Duke (all of 90 guns), HMS Foudroyant (80), HMS Monarch, HMS Hector, HMS Centaur, HMS Shrewsbury, HMS Cumberland, HMS Berwick, the ex-French HMS Courageux, HMS Thunderer, HMS Valiant, HMS Terrible, HMS Vengeance, HMS Elizabeth, HMS Robust, HMS Ramillies and HMS Egmont (all of 74 guns), HMS Exeter, HMS Stirling Castle, HMS Vigilant, HMS America, HMS Bienfaisant, HMS Worcester and HMS Defiance (all of 64 guns). In addition to the ships of the line, there were the frigates HMS Arethusa (12pdr 32), HMS Proserpine, HMS Milford, HMS Fox and HMS Andromeda (all 9pdr frigates with 28 guns), the post-ship HMS Lively of 20 guns, the bomb vessels HMS Pluto and HMS Vulcan and the armed cutter HMS Alert of 12 guns. 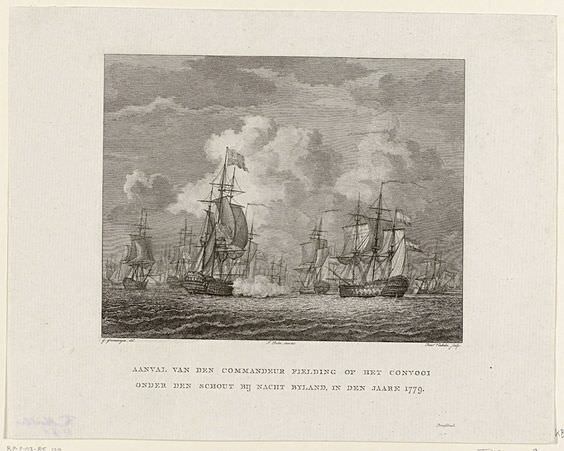 Just days before the Channel Fleet put to sea again, war had been declared by the British against the French, so when Keppel ordered the fleet to sea on 9th July, it was on a war footing and the Admiral was looking to force an early confrontation with the enemy, which he hoped would be decisive. In the afternoon of 23rd July 1778, HMS Thunderer was at sea with the fleet as part of Admiral Keppel's strategy to try to force an early confrontation with the French Atlantic Fleet, under the command of Vice-Admiral Le Compte Louis Guillomet D'Orvilliers when the French fleet was sighted. Now, it was the turn of the French to get a nasty surprise. 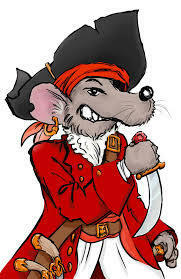 The Compte D'Orvilliers had been led to believe that Keppel's fleet would only have 20 ships of the line instead of the 30 he now saw ranged against him. D'Orvillier's mission was to conduct commerce raiding operations in the Atlantic Ocean and Western Approches and to try, if possible, to avoid a confrontation with Keppel's fleet. 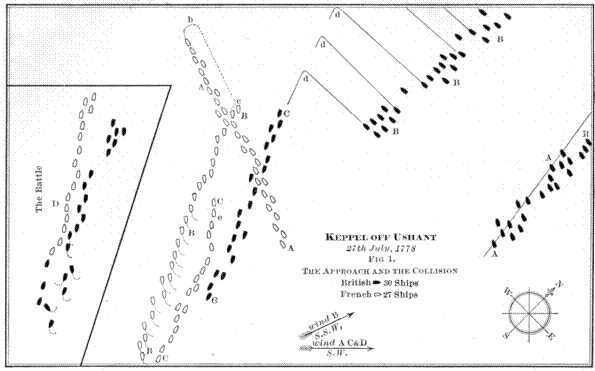 On receiving the news that the enemy was in sight, Keppel ordered a general chase, which continued until about 19:00, when the French suddenly altered course towards the British. Keppel, who preferred to avoid a night action, ordered that the Channel Fleet alter course to bring them on a parallel heading to that of the French. Overnight, D'Orvilliers manoeuvred his fleet to gain the weather gage, that is, to put himself upwind of the British, giving himself a tactical advantage. Keppel was not too bothered about this as although it enabled the French to use the prevailing wind to their advantage, it also put his fleet between the enemy and their home port at Brest. Two French ships, the Duc de Bourgogne (80) and the Alexandre (64) became detached from the enemy fleet, set course back to Brest and evaded the ships sent by Keppel to chase them down. Things continued in this way for the next three days, with the French constantly frustrating Keppel's attempts to bring them to action. In the early morning of 27th July, the wind changed and allowed Keppel's fleet including HMS Thunderer to close the range. At 05:30, Rear-Admiral Campbell took it upon himself to directly signal seven of the nine ships in Palliser's Rear Division to make more sail towards the French. Palliser was furious. Not only was he Campbell's superior officer, but he felt Campbell had subverted his command. He felt that, firstly the order should have come from Keppel himself and secondly, that it should have been passed through him, rather than directly to ships under his command. This was an unfortunate portent of things to come. At 09:30, the French changed tack and headed towards the British, who were sailing in line abreast, that is, with the ships sailing alongside each other rather than following each other in a line. Keppel, fed up with the French avoiding action, had decided to force the issue now that the weather was in his favour. At 10:15, Keppel ordered another change of course, this time, bringing his fleet into line ahead so they could close the range and sail along the enemy's line in the opposite direction. The Rear Division had still not recovered from the confusion which followed Campbell's signal. At 11:20, the French opened fire. The next two hours saw fierce fighting in which ships of both sides were badly damaged. Confusion reigned in the Rear Division. HMS Elizabeth had been forced to take evasive action to avoid a collision with the stern of the flagship, HMS Formidable, which had come to a stop in order to continue her action against the rear-most two French ships of the line and HMS Ocean had difficulty aiming her shot between HMS Formidable and HMS Egmont, so close together were the two British ships. In the meantime, at 13:30, the Vanguard Division had completed it's first pass of the French line and had come about in order to begin another pass. At the same time, the Centre Division was getting clear of the French line, but HMS Victory had been so badly damaged in her masts and rigging that the manoevre to come about took almost an hour. At the same time, the French commander had ordered a change of course in order to allow his ships to engage a small group of about five British ships of the line which had been disabled. Keppel realised what was going on at 14:30 and ordered his ships to form a diagonal line, blocking the French ships from engaging. The French Admiral realised what was going on and backed off. At 16:00, the British Centre and Vanguard Divisions had regained their formation and were sailing parallel to the French, whose Vanguard Division was abreast of the British centre. Keppel saw his chance, if he could alter course, he could cut off the French vanguard, surround the French fleet and destroy it wholesale. For this to be successful, Keppel needed Pallisers Rear Division to join the line in their proper position. He signalled Palliser to take up his station, but by 17:00, he had not received any reply, so sent HMS Fox to investigate and find out what was going on. By 19:00, the Rear Division had still not taken up it's proper position, so Keppel resorted to signalling individual ships, giving them the order to regain their stations. By the time they finally did this, it was too dark to recommence the battle, so instead, Keppel ordered that the fleet keep station on three sets of stern lights on the horizon, assuming them to be enemy ships. Dawn the next day saw the realisation that the three ships they had followed through the night had been decoys. The rest of D'Orvilliers' French Atlantic Fleet had slipped past the British in the night and had escaped back to Brest. Keppel ordered that HMS Prince George, HMS Duke, HMS Elizabeth and HMS Bienfaisant chase them down, but neither HMS Prince George or HMS Elizabeth were in any condition to give chase due to battle damage while the three French vessels were relatively undamaged and easily escaped from the pursuing British ships. With the First Battle of Ushant proving to be indecisive, Keppel took the fleet back to Plymouth where they quickly made repairs and were back off Ushant by the 23rd August. The Channel Fleet was unable to bring the French to action and arrived back at Spithead on 26th October. Things came to a head on the 9th December, when Palliser formally accused Keppel of Neglect of Duty and Failure to do his Utmost in the Battle against the French. A reluctant Lord Sandwich ordered Keppel to face a Court Martial, knowing that if convicted, Keppel would face the death penalty like Admiral John Byng before him. The Court Martial began aboard the 100 gun first rate ship of the line HMS Britannia in Portsmouth Harbour on 7th January 1779 and was a farce from beginning to end. Palliser, with powerful political friends on his side, led the prosecution himself and maintained that Keppel was to be held accountable for"not marshalling his fleet, going to fight in an un-officer like manner, making scandalous haste in quitting, making sail away from the enemy, giving them an opportunity to rally, and presenting the appearance of flight disgraceful to the British flag". The trial became a public sensation and caused uproar, not just amongst the general public, but more worryingly during a time of war, amongst the most senior admirals in the Royal Navy. Things went from bad to worse when it became clear that evidence had been tampered with in that log book pages which supported Keppel's version of events were mysteriously missing, or had been conveniently corrected and re-written later. Keppel put up a fierce defence, which basically exposed the fact that the whole trial was nothing more than a politically motivated witch hunt and the Admiral was unanimously and honourably acquitted on 11th February. The Court Martial Board declared that the charges had from the beginning been malicious and unfounded. The only criticism they directed at Admiral Keppel was that he should have directed signals to individual ships under Pallisers command earlier than he did if he wanted to force a second engagement against the French that day. Keppel was carried through the streets of Portsmouth and held a party at his home with over sixty captains invited. The people turned against the Government and their supporters. Palliser's London home was ransacked by a mob who burned his furniture on a bonfire in St. James' Square. His sister's home in York was also demolished by a mob. Vice-Admiral Sir Hugh Palliser's positions, both in the Royal Navy and as an MP became untenable and he was forced to resign from both. On 12th February, the House of Commons voted their thanks to Keppel, followed on the 16th by the House of Lords. On the 18th, Admiral Keppel was given the Freedom of the City of London. With Keppel's acquittal and the subsequent uproar, Whig politicians smelled blood and their leader, Charles Fox forced a vote in Parliament to censure the Admiralty for their treatment of the hero of the Battle of Ushant. During the debate, Fox alleged that the Tory Lord Sandwich had deliberately failed to inform Keppel of the true strength of the French Brest Fleet, or at least had been incompetent in failing to ascertain their true numbers. The Tory Government led by Lord North scraped together enough support to vote down Fox's Motion by a narrow margin. In the meantime, Admiral Keppel, in poor health and tired of being used as a political pawn, wrote to the King asking to be released from command of the Channel Fleet. The reason he gave was that he was no longer prepared to serve under men he did not trust. The King was less than impressed and passed the letter to the Admiralty and after heated correspondence, Keppel resigned from his command on the 18th of March. Palliser had in the meantime requested a Court Martial of his own in order to try to clear his name. The Court Martial, held aboard HMS Sandwich at Portsmouth turned into a Board of Inquiry as no charges were ever laid. Lord Sandwich, embarrassed enough already, tried to fill the Court Martial Board with sympathetic Tory supporters, but was not entirely successful. Although Palliser was cleared of any wrongdoing and the Court Martial Board had been seen by a suspicious public as being biased, his acquittal was not a unanimous verdict and this alone pursuaded the Admiralty not to restore Palliser to his command. He was instead offered the highly paid post of Governor of the Naval Hospital at Greenwich. In the meantime, tensions were also rising between Great Britain and the Netherlands, who had been close allies since the Glorious Revolution of 1688. Relations between those nations had been strained by the Dutch remaining firmly neutral in the Seven Years War and refusing British requests for assistance in the fight against the Americans. Dutch merchants had inflamed the situation by facilitating trade between the Americans and the French, where American goods were shipped to France via the entrepot on the Dutch-held island of St. Eustacius and French-made arms and ammunition as well as money flowed the other way. The British had known about this and had begun to stop and inspect Dutch merchant ships looking for war materials. This action had outraged influential Dutch merchants who had demanded that their ships travel in convoy, escorted by Dutch warships to prevent the British from stopping them and seizing cargoes considered contraband. In December 1779, HMS Thunderer was still in the Channel Fleet and on the 27th, a Dutch convoy of 17 merchantmen left Texel bound to the Mediterranean. The convoy was escorted by a squadron of warships consisting of the Princes Royal Fredrika Sophia Maria (flagship, 54), Zweiten (44), Argo (40), Valk and Alarm (both of 26 guns), commanded by Rear-Admiral Count Lodewijk van Bylandt. On the 30th, the Dutch convoy was intercepted by a powerful British squadron under the command of Commodore Charles Fielding, flying his command broad pendant in the 90-gun Second rate ship of the line HMS Namur. In addition to HMS Namur and HMS Thunderer, Fielding's squadron also comprised the ex-French HMS Courageux, HMS Centaur and HMS Valiant (all of 74 guns), the fourth rate ship of the line HMS Portland (50), HMS Emerald (12pdr, 32), HMS Seaford, HMS Camel (both 9pdr-armed, 20 guns), the brig-sloop HMS Hawk (10) and the snow-rigged HMS Wolf of 8 guns. Fielding demanded that the Dutch ships stop and be boarded for for inspection, a demand which van Bylandt refused. In the negotiations which followed, Fielding informed the Dutch admiral that he would send boats to board and inspect the Dutch ships in the morning, as the light by this time was failing. The Dutch admiral replied that any boats sent by the British would be fired upon. During the night, twelve of the Dutch merchant ships made off, so that when the sun rose, Fielding saw there were now only five and decided that he would stop further escapes by ordering HMS Namur and two of the 74s to surround the Dutch. This move was blocked when the Dutch flagship and the Argo blocked their path, so HMS Namur put her launch into the water and sent it on its way to one of the Dutch merchantmen. The Dutch flagship fired twice across the boats bows, at which point HMS Namur and the two 74-gun ships each fired a full broadside at the Dutch. 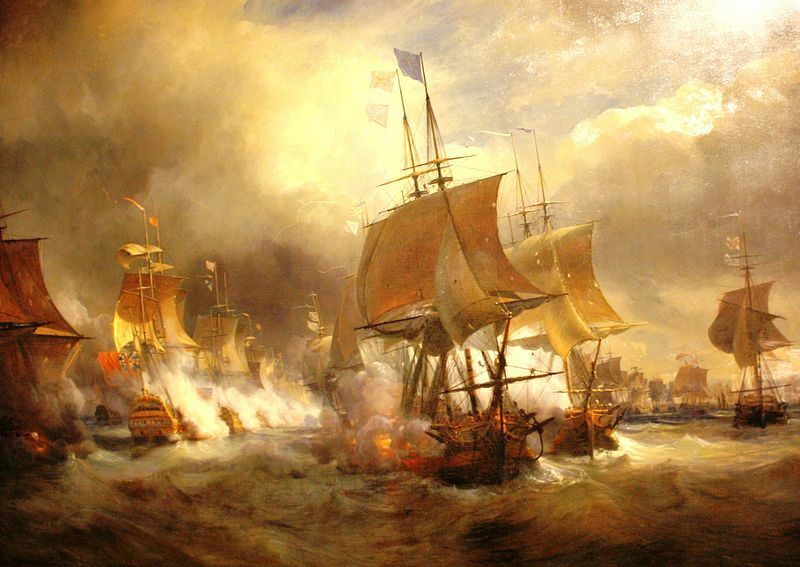 The Dutch warships returned fire ad then struck their colours in surrender. The British then searched the Dutch ships and finding contraband goods, arrested them and escorted them into Portsmouth, followed by the Dutch warships, whom Fielding had offered to let go. The Affair of Fielding and Bylandt caused a storm of protest in the Netherlands and was a major trigger behind the outbreak of war with the Dutch a year later. In April of 1780, the fleet under Vice-Admiral Sir George Brydges Rodney in the Caribbean had engaged a French fleet under the Compte de Guichen in two indecisive battles off Martinique and Rodney had requested reinforcements. On the 28th May 1780, HMS Thunderer departed Portsmouth bound for the Caribbean as part of those reinforcements, joining Rodney's fleet on the 12th July. In early October 1780, HMS Thunderer was patrolling off San Domingo. The early part of October 1780 is significant because it was then that the Leeward Islands were struck by the most powerful hurricane ever recorded. Called "the Great Hurricane of 1780", it swept all before it and is estimated to have killed more than 22,000 people across the Caribbean region. On the British-held island of Barbados, only two houses on the entire island were left standing, bark was stripped from trees and the Naval Hospital was destroyed when it was struck by a ship. According to meteorologists, this level of damage could only have occurred if the average wind speed was greater than 200mph. In recorded history since, only Hurricane Mitch in 1998 came close to the Great Hurricane of 1780 in terms of the numbers killed. French possessions fared no better and 9,000 people were killed on Martinique alone. In the Great Hurricane of 1780, HMS Thunderer foundered and was lost with all hands. Amongst those lost was Mr Midshipman Nathaniel Cook, the second son of James Cook, the great explorer.